Do you live in the Welland riding or in the Niagara region? Join MPP Cindy Forster for the opening of her new Constituency Office! Ontario NDP Leader Andrea Horwath will be the special guest. Congratulations to the new Executive of the New Democratic Youth of Canada // Jeunes néo-démocrates du Canada! Special shoutout to our ONDY members elected; Ali Chatur, Tony Bui & Amin Ali! In Ontario, there is only one political party & one leader fighting for a $15 minimum wage! Sometimes in the young left, we get so caught up in the fight for sweeping institutional change (free tuition, meaningful climate justice) that we forget about the equally important battles our MPPs go to bat for every day. We can be proud of the work presently being done by the Ontario NDP caucus in response to the Liberal government's unjust treatment of children living with ADS. Removing kids over the age of 5 from the waitlist for care - kids who have waited years - is no way to improve services. We need real investment, not a band-aid solution that leaves a generation of children out in the cold. 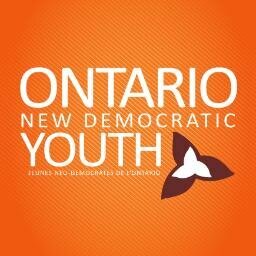 We have a new regional NDP Youth Club in Durham region! Give the new Facebook page a "like," below! Our co-chair Guled Arale weighs in on the urgent need for the NDP to connect with racialized communities. We had a fantastic ONDY presence at the NDP Convention in Edmonton! Thanks to all who came from campus and regional clubs across the province! A very exciting new Facebook page has been created! This page explains the approach taken by Libby Davies, Craig Scott, Avi Lewis and Janet Solberg towards the Leap Manifesto at the NDP Convention in Edmonton. Read more of what they think on their page! We'd like to welcome our two newest exec members: Nikolas Lopez (Policy Director) and Mehma Kaur (Central-West Regional Organizer)! Congratulations Nik and Mehma, and thank you to all that applied! Congratulations to Brock NDP for electing their new Executive! Proud our NDP leaders today. Thank you to Tom Mulcair & Andrea Horwath for saying #WeBelieveSurvivors. Thank you to Niki Ashton for launching a campaign to address the rising challenge of precarious work among millennials! Join University of Ottawa NDP / / NPD de l'Université d'Ottawa today at their table in UCU! Hi everyone! The ONDY is working to maintain better communication with our members as part of our efforts to increase youth membership and engagement in Ontario. Feel free to fill out the form below for information and updates on youth organizing in your region! Join MPPs Peter Tabuns & Cheri DiNovo on March 29th, 2016 for a town hall on the Leap Manifesto with Avi Lewis. Details are below! Congratulations to the newly elected Executive of the University of Ottawa NDP / / NPD de l'Université d'Ottawa! Congratulations to the University of Ottawa NDP / / NPD de l'Université d'Ottawa for hosting their AGM last week! Huge thank you to Niki Ashton for being the guest speaker. These are some great photos from the tabling event run by Brock NDP over the past few days! Join Brock NDP for their tabling event next week! Join UofT New Democrats for this important session with MPP Jagmeet Singh on carding in Ontario! ONDY Campus Clubs spoke to hundreds of students and collected over 1000 signatures in support of re-establishing the Ontario Anti-Racism Secretariat. Thanks to the amazing campus clubs across the province, the ONDY was able to get over 1000 signatures in support of the Ontario Anti-Racism Secretariat! Now is the time for the province to take action on this important issue! UofT New Democrats out on campus today to support the Anti-Racism Secretariat! 500 signatures! Amazing! Thanks Carleton NDP for tabling in support of the Anti-Racism Secretariat today! Campuses across the province are taking action today in support of re-establishing the Ontario Anti-Racism Secretariat! Here are some photos from the day so far! Today, NDP Clubs across the province will be hosting Days of Action in support of the re-establishment of the Ontario Anti-Racism Secretariat! If you're participating, be sure to tweet at @theONDY on Twitter & use the #YestoOARS! -- Aujourd'hui, les clubs NPD aura des journées d'actions en faveur de la re-création du Secrétariat antiracisme de l'Ontario! Si vous participez, assurez-vous de tweeter @theONDY sur Twitter et utilisez #YestoOARS! Don't forget: Our youth canvass for Niki Lundquist in Whitby-Oshawa is coming up! Join us for a canvass in Whitby-Oshawa! Interested in attending the NDP Convention in April? Check out edmonton2016.ndp.ca for more information! UofT NDP at their Winter Clubs Day today!